The joyous feeling of having a baby and becoming a parent quickly turns to thoughts about how to protect them and keep your bundle of joy safe at all times. 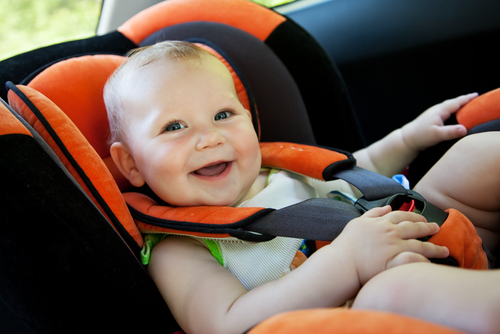 When it is time to start transporting your baby, you will no doubt want everything to be perfectly safe and that means childproofing your automobile in preparation for a baby on board. You will soon discover that babies and mess go together so you might want to consider using some car seat covers from someone like ShearComfort.com, and once you have done that, it will be time to ensure that the car seat you have chosen is installed correctly in order to keep your baby secure. A car seat is absolutely essential in keeping your baby safe and secure and when you consider that you quadruple the risk of serious injury in a car crash when your baby is not strapped into an approved car seat, this is not a gamble that any parent would want to take. Get advice from the car seat supplier to ensure that you use the right car seat for the baby’s weight and age and also consider getting the seat fitted by an expert if you are unsure how to do it yourself. There is a lot of debate about whether to install a rear-facing seat, which is considered to be safer according to the American Academy of Pediatrics, and should be used until the child is 2 years old, so you may want to do some research and decide what type of seat you are most comfortable with. Obviously a baby is not going to try and get out of the car by opening the back door, but it makes sense to turn on the child-proof lock in preparation for when they are older and also if you are transporting any older kids. You will find that in most cars there is either a button that you press on the drivers door to activate the lock or it may be a lock that you slide across on the rear door itself to prevent a child opening it from the inside. Check the manufacturers manual if you are not sure how to activate your child lock and enjoy peace of mind by knowing that a child won’t be able to open the door without your assistance. Another consideration is protecting your baby from the sun, as a baby’s skin is considerably more sensitive than an adult and therefore needs adequate protection. Although window tinting can help to diffuse the sun’s rays, it is not a solution that you can rely on and you should install a sun shade. You have a choice of shades. A sticker sun shade offers a semi-permanent solution and can be cut to fit your window and then stuck on to the surface. Another popular choice is a fabric sun shade, which can easily be repositioned and this means that you can move it around depending on where the sun is coming in. Take the time to think about how safe your car is for your child and always seek some qualified advice if you are unsure about how to protect your special cargo. Paul Skye works as a safety officer and likes to offer his insights on related topics with an online audience. You can find his thoughts on a number of different websites. This entry was posted in Kids Care and tagged Automobile, Childproofing, tips.